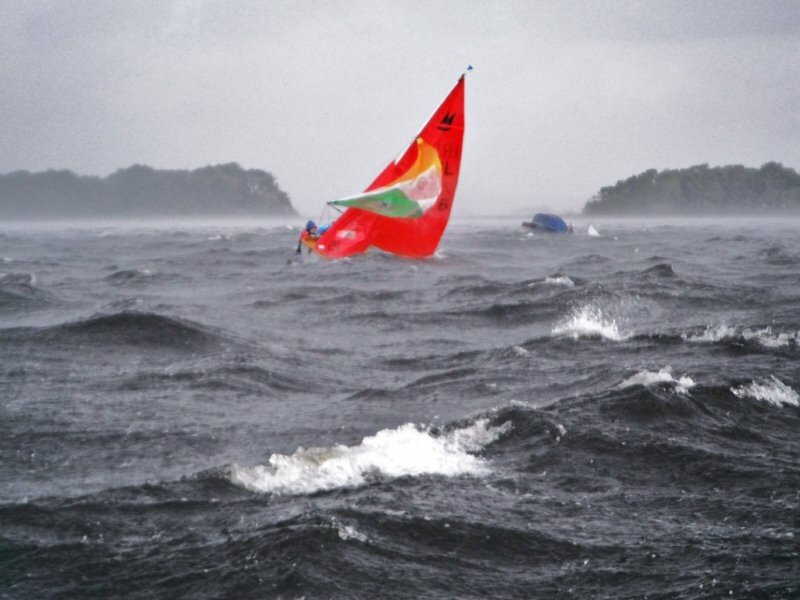 For those who missed out on the 2013 World Championships at Lough Derg, and those whose memories are fading, here is a photo of one of those squalls. There is an excellent report of the 2013 Mirror Worlds on the afloat.ie website. After the recent Mirror Worlds on Lough Derg, Afloat.ie's Cormac Bradley made contact with Mike Robinson, the father of the winning combination, to get some backgroud to the "Team Robinson" win. While Ryan and Michaela won the 2013 version in Lough Derg, their siblings had finished in the top five in the previous Worlds in Australia, won by Northern Ireland's Ross Kearney. Mike is an ex-Fireball dinghy sailor and the story he describes below proves that you don't have to have all the latest gear in order to win a Worlds. Given the problems the Irish Mirror Class perceived they had at the time of the ISA AGM (with respect to the Worlds and the support thereof), this story has more than one salutory lesson. Question: At what point did you realise you had victory in the bag? Ryan Robinson: We went into the last day with all to play for. Three points ahead of second (the "Philippinos"). Luckily we were discarding a 9th and a 10th while the Philippines Team were discarding a 33 and a DNC. We managed to beat the Philippines Team in the second last race by a few places. Then the last race came with a few boats being black flagged and... We were one of them! This meant that if the Philippines Team won the last race, they would get the title. While leaving the race area, with our tails in between our legs, a friend of ours, sailing for Ireland, came past us and screamed "Guys you've won, the Philippines also got a black flag!" As true as Bob, he was right! Michaela jumped straight into the water, and a feeling of total relief flowed over me. Then total elation! That was the response elicited from Ryan in an interview after winning the Mirror World Championships held at Lough Derg in Ireland in August 2013. They were the first South African team to achieve this, and a relatively young team, at that, aged 16 and 13 at the time. I don't know if this achievement should be described as a culmination, the end of the story, or just another chapter, but Cormac Bradley of Afloat.ie asked me to put our family's experiences down in writing, so that they can be shared by others. The older children, Kathryn, Ricky and Brennan, had all sailed Optimists without much success and without much sparkle. It must be said that the family was a little impecunious at that time, and their equipment was not the best available, but there was more to their lack of success than just that. There was another undefinable factor. Whether it was apprehension, something a little short of fear, a lack of fun or something deeper, I am not sure, but Optimists just did not cut it for them. So, we bought an old Mirror. And, I mean old. We paid R200-00 (about 30 Euros or 20 Pounds) for it. It didn't look great. It had a thirty year old suit of "Fast Sails" made by a company who specialised in the manufacture of tarpaulins. There were copper ring nails (as were used in the construction of the Ark, I am sure) all over the hull. It had clearly been built in the pre-epoxy era, and every seam was shaky. Ricky and Brennan, then about ten and eleven, set about sprucing it up with relish. They found a half empty tin of swimming pool paint that had the word "polyurethane" somewhere on the label, and we ended up with a reasonably badly painted blue and white Mirror, with really badly blown sails. A strip of duct tape was stuck down the leech to try and encourage some shape in a sail which was decades past its sell-by date. The South African Junior National championships that year, were the first where boats other than Optimists and Dabchicks were invited. Brennan sailed the blue Mirror with his little Boskop Yacht Club friend Sean, who still sails with the family from time to time. This regatta was Kathryn and Ricky's last in Optimists. Ricky and Brennan sailed the old blue Mirror in their first Mirror Nationals at the ages of 11 and 12. They asked whether they could have some new sails to replace the black duct taped leech set, but were told that new sails would only come their way if they cracked the top ten. Up to this point, our children's sailing had not cost much – but that was going to change! They did not make the top ten. They finished eleventh. Father heaved a sigh of relief. The cost of a set of sails was going to be pushing what was then a very skinny budget. But they had lost places in one race because a knot that Father had tied had come loose. So, they applied to Mother for redress, and the next thing we knew, there was a nice set of Harry Ellens's best, hanging from the gaff. Each time they sailed the old blue Mirror, their confidence grew. It was a complete turnaround from the family's experience in Optimists. It seemed that they were making each other brave, and were feeding on each other's enthusiasm. Brennan, the younger, and the less dexterous of the two was the helmsman, with Ricky, the crew and tactician. The combination was a masterstroke. Ricky immediately took on the mantle of the de-facto mentor, while Brennan had the confidence boost that came with holding the stick. So confident had they become, that one day they approached their father to ask if they could enter the selections for the Mirror Worlds in Tanzania. With the family's budget just having recovered from the new sails, and with the likelihood of them being selected in the old boat very slim, even remote, and with Mother menacingly watching every move, Father gave the go ahead. After all, what harm could it do? In the unlikely event of them being selected, one could drive from Carletonville to Tanzania with a Mirror on the roof. And, lo and behold, they were selected. Theirs was the fifth name to be announced in the team to go to the Mirror worlds. Father sat, awed, not only by his sons' achievement, but also by the apparent dyslexia of the chairman of the South African Mirror Class Association, an Afrikaans gentleman, who kept on referring to Tanzania as Tasmania. It turned out that dyslexia was not at issue here. And obviously, the decision to school the children in Carletonville was now severely in the spotlight. "Do you have any concept where Tasmania is? Do you have any idea what this will cost?" "Dad, it always was Tasmania. You just don't listen properly!" And again, they applied to Mother for redress. And, again, got it! This, by the way, has been a recurring theme. Fuad Jacobs was commissioned to build a new racing Mirror. A stunning looking boat, pretty as a piece of furniture, and christened African Express after the Fireball that Mother and Father had sailed together. Harry Ellens's sails just had to do, the budget would not stretch to new sails as well. 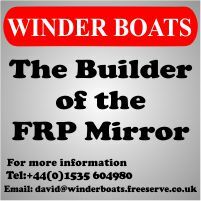 The boys got hold of a copy of the book "Mirror Racing" by Guy Wilkins, and spent hours fitting the boat out and setting it up exactly as the book said. Before they left, in fact it was on the way to the airport, just after Father had handed over the family credit card with instructions to use it in the case of emergency only, that they were given the instruction to meet people and make friends. The two little boys from Carletonville, on their way to a place on the other side of the world, to compete in a regatta against the best Mirror sailors in the world, were justifiably apprehensive. They asked how he expected them to do that. Father had to think on his feet (as fathers often have to do, I am sure) and the best he could come up with was a vague strategy: After each race, go and find the winner. Shake his hand and say, "We are Ricky and Brennan from South Africa. Congratulations on your win." And see what happens. After the first race in the pre-world regatta, they went up to the winner and said "We are Ricky and Brennan from South Africa. Congratulations on your win." He said, "Hi. I am Guy Wilkins." That rather contrived meeting with the author of their sailing Bible, was the beginning of the first of many friendships that this family has built up with really nice people all over the world. Some of them have gone on to do amazing things in the world of yachting, like Olympic representation and world championship medals, and some are just good friends. The Facebook pages are littered with sailing friends from all over the world – all starting with that simple introduction. Ricky and Brennan did not do badly in that regatta, and sailed one more Mirror Worlds together in Sweden, after which, their weight combination was just too much for the Mirror. They had started sailing 420s alongside the Mirror, and in fact sailed in three Youth World Championships together, with Ricky on the helm this time. Ricky has become a formidable helmsman, eventually helming the Royal Natal Yacht Club entry to victory in the Lipton Cup. At his side, as tactician was Brennan, an excellent crew, but a very good helmsman in his own right. Not bad for two little boys who just could not make it happen as single handed sailors. Ryan (nine years younger than Brennan) had his first experience in Mirror Racing at the twenty four hour race at Milnerton Aquatic club, sailing as part of a family challenge, but he was always destined to sail with his hero, Ricky. 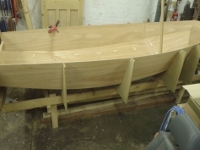 Kathryn commissioned a wooden hull from Steve Du Toit, South Africa's foremost dinghy builder, and it was game on. She (the boat that is) was stunning, and was christened (in keeping with Ricky's new status of "university student") Mirrorjuana. Brennan took over sole control of African Express, but Michaela Mae, then only about seven years old, was just too small for the Port Elizabeth worlds. He sailed with young Julian. Ryan got to sail with Ricky. And that is where the mentorship started in earnest. Mirrorjuana's history is a little chequered. She was collected from Steve du Toit immediately before the Selection regatta for the Port Elizabeth worlds. Ricky, with Ryan (then about ten or eleven) as his crew, won the selection regatta, with Brennan and Julian close behind. No sooner had the little boat showed its potential, when it fell off the trailer on the way home. The newly acquired boat straps just did not have the same staying ability as the Mirror. So off she went, back to Steve for a rebuild. The Port Elizabeth Mirror Worlds were interesting. The city had put on her finest clothes for the occasion, the organisation was superb and a whole lot of friends that Ricky and Brennan had made in Tasmania and Sweden arrived. All five of the children were there, so the capacity to make friends was multiplied. With these five interacting with the existing friends from Tasmania and Sweden, and the new arrivals, the family's circle of Mirror friends grew exponentially. One of these friends was Johnny McGovern, who was press ganged into being the South African team coach, for the rather dubious privilege of spending some time with the Robinson family. Ryan was a little boy. Not particularly athletic, with an air of trepidation about him. The one thing he had going for him though, was his adoration of Ricky. There was nothing that he would not do to earn the respect of his hero. Brennan, who had always been earmarked as the ship's secretary, remarkably, started to live out his aptitude for tinkering. (One does not perform engineering on a Mirror – one tinkers.) African Express slowly converted into a minor masterpiece of expertly spliced twine on intricate multi purchase gadgets. It was a great family time. The three students enjoying the pleasures of their young adulthood with the friends that they had built up over the previous years, and the B team, being drawn into that circle when appropriate, and back to the Mom and Dad comfort zone when the going got tough (or inappropriate, as the case may be). And the transfer of knowledge was well on the way. Ryan hung on to every word that Ricky said. Johnny was amazingly patient and explained endless intricacies that Ryan pretended to grasp. Brennan had an entourage of girls following him, but the most persistent of all was a seven year old, with a haircut that made her look like a mushroom. She stuck to him like a leech, always carrying a piece of line, practicing knots that he was teaching her. And the results were not bad. African Express around eleventh, and Mirrorjuana around fifth. Somehow, the Mirror Worlds in Wales sneaked by unnoticed. And with the family budget being as unpredictable as always, it's probably just as well. There may have had to be a call to be made between University Fees and Airfares, and with Mother on the redress panel, who knows where that may have ended. Ricky and Brennan were now sailing 470s, and anything else they could lay their hands on, and were helping with the training of youngsters in the various junior fleets in South Africa. Kathryn was making a name for herself as a keelboat crew. But when it came to Mirrors, there were some changes in the air. Michaela Mae declared herself Brennan's crew. There is no certainty about what Kathryn may have thought of her chances of becoming the crew on African Express, but if she had any ambitions, they were shredded by this bold move. She was destined to fill the role of substitute crew. Ricky was now approaching the top of the class as a helmsman, and should have been assessing his chances at a medal at the up-coming Mirror Worlds in Albany. He chose instead, to take up the position that he held when he and Brennan started out, at the front of the boat, and hand the tiller over to young Ryan. This decision was pivotal – and was the cornerstone behind the future success. Ricky and Brennan's decision to take the time out of their other sailing stuff, to spend time sailing with, and mentoring their younger siblings, was the decisive moment in the development of Ryan and Michaela into a winning combination. And each had his challenges. Brennan had to help Michaela overcome her fear of heavy weather, and teach a really little girl the skills required to be a successful crew in a World Championship regatta. Ricky had to find ways to instil confidence into Ryan, while transferring to him as much skill and understanding as Ryan could absorb. And this all had to happen against the background of Father's insistence that they always treat each other with respect, and that the sailing always had to be fun. And each had a different perspective and skill set to pass on. From Brennan, Michaela learnt a passion for knots and splicing, learnt the art of flying a spinnaker, upped her concentrations levels and learned to focus on the job at hand until its conclusion. Ryan learned about intensive helming, boat speed, surfing and sail trim. And both learnt about the art and science of yacht racing, from tactics at the start through to covering up the last beat. With Michaela being three years the junior, she was learning at a slightly more basic level, but there were no excuses made for her youth. She had committed to the plan, and she was held to her commitment. African Express and Mirrorjuana were duly selected for the Mirror worlds in Albany, Australia. Then came the curved ball. The family was given the opportunity to sail together in the Cape to Rio race, on a boat lent to them for a case of beer. Common sense said that the Rio Race should take precedence. The budget agreed with the common sense approach, and Father made the proposal that the Mirror Worlds in Albany should be taken off the family agenda. Again, they appealed to Mother for redress. Again, redress was granted. So while Mom Dad and Kathryn made ready for the Rio race, Ryan and Michaela set off for Albany in the company, care and custody of their older brothers. And it worked out well. African Express, by now an old lady, in a fleet of shiny new glass fibre Mirrors, had a few breakages, one of which was the new aluminium boom, which broke early on in the game, only to be replaced by the original wooden boom, which she still sports to this day. Another was a critical failure to the vang in the closing stages of the event, which resulted in Brennan and his intrepid little crew logging around eleventh overall. Mirrorjuana, on the other hand, revelled in her new crew format. Ryan was nicknamed "Pocket Rocket", and he and Ricky left Australia well satisfied with their fourth place. And, of course, they broadened their circle of Mirror friends, with Ryan and Michaela bringing a new generation into the circle. There was a logic developing here. The next step needed to be to set the little ones free to fend for themselves in the Mirror fleet. And so it was that Ryan and Michaela teamed up for the Lough Derg Mirror Worlds. The build-up was quite hectic, with Michaela sailing her Oppie with some success, and Ryan trying his hand at following in his brothers' footsteps on a 420. Ricky and Brennan were always closely involved in the sailing activities of the younger siblings, notwithstanding their studies, their 470 aspirations and their involvement in what eventually turned out to be a successful Lipton Cup campaign. As it happened, Ryan and his pal Dominic, were selected to represent South Africa in the ISAF Youth Worlds in Cyprus, which ended the day before the Irish Nationals started. Michaela, in turn, was selected to sail In the South African Optimist team at the African Optimist Championships in Langebaan, which literally started five days after the Mirror Worlds ended. I am sure that the thought of a new glass fibre Mirror crossed a mind or two. I am sure that the spars and foils were examined with a view to being replaced. I know that the sails were at least three years old. But, the budgetary pressure occasioned by the simultaneous realisation of all these ambitions was clear, even to the youngest of the team. The Irish Mirror Worlds were going to have to be contended in a seven year old rebuilt wooden boat, with the existing spars, foils and sails. Nobody even thought of redress. I think that even Mother realised that if redress was granted, it may impact on her chances of accompanying the expedition to Cyprus and Ireland. Ryan and Dom took a bit of a pasting at the Youth Worlds, and Michaela was on hand to witness the humble pie being chewed, as the reality of just how fierce the competition on a global scale really is, set in. And that was the reality that they had to face, when they arrived in Ireland. Not the hottest boat in the fleet. No new equipment. Ryan nursing a severely bruised self-confidence, and Michaela watching surreptitiously out of the corner of her eye, to see if he would pick up, or fold completely. And the luggage was lost! Two things conspired to get things on track during the course of the Irish Nationals. The first was Michaela's indomitable nature. Ryan had no choice but to buck up, and keep up with her as she set them up in the routine that Brennan had taught her. Check every fitting. Check the rake. Foils. Sails. Rig tension. Water in the hatches. The second was the joy of running into their old friends, and the pleasure of making the acquaintance of a whole lot of new friends. Vastly different from the stiff relationships encountered at the Youth Worlds. Very soon, it was clear that they were in a comfort zone. They were lent gear by people that they had never met before, until the luggage arrived. And they were absorbed into the Mirror community. By the end of the Irish Nationals, the team seemed to be on track. They stuck to the concept of the routine for the whole regatta – right up to the last race. A pre-launch routine. A pre-start routine. A post-race debrief chat on the water. A de-rigging routine. And in that routine, they found confidence, especially, when the results started to look good. In the switchy conditions that prevailed, it was clear that consistency was going to be important, and that conservative sailing was going to be the key. Father thought he had got the three pronged theme of confident conservative consistency embedded in their combined being, when suddenly it became apparent that Confidence had suddenly over taken the other two prongs. Heading out to the start on the second or third day of the worlds, on a support boat, it was clear, in the distance that the race had just started. An SMS message arrives from South Africa: "Port Start?" Father's response: "Please no!" Rosanna, the pretty driver of the RIB pressed the pedal to the metal, and the rib got there just in time to witness Ryan and Michaela crossing the entire 91 boat fleet on port in 20 knots of breeze. Clearly, the Mojo had been found. And if there was any disadvantage to sailing the older wooden boat, it was not evident. Mind you, it must be noted that Ricky and Brennan were meticulous in the way they looked after and stored the Mirror equipment, and ensured that Ryan and Michaela followed suit, which had the effect of enhancing the longevity. From the earliest days, when Brennan helmed, and Ricky crewed, it was clear that a proper team had at its disposal the sum of the intellects of the crew members, as opposed to the intellect of the skipper supplemented occasionally by snippets that he allowed from the crew. It seems that when this teamwork is supplemented by the transfer of knowledge, skills and experience by way of both deed and word, that anything is possible. That, I hope, is the story that Cormac wanted me to record. Is this the end of the story? Or just another chapter? Does logic dictate that Ryan will be crewing for Michaela at the Mirror Worlds at Theewaterskloof? Time, no doubt, will tell. 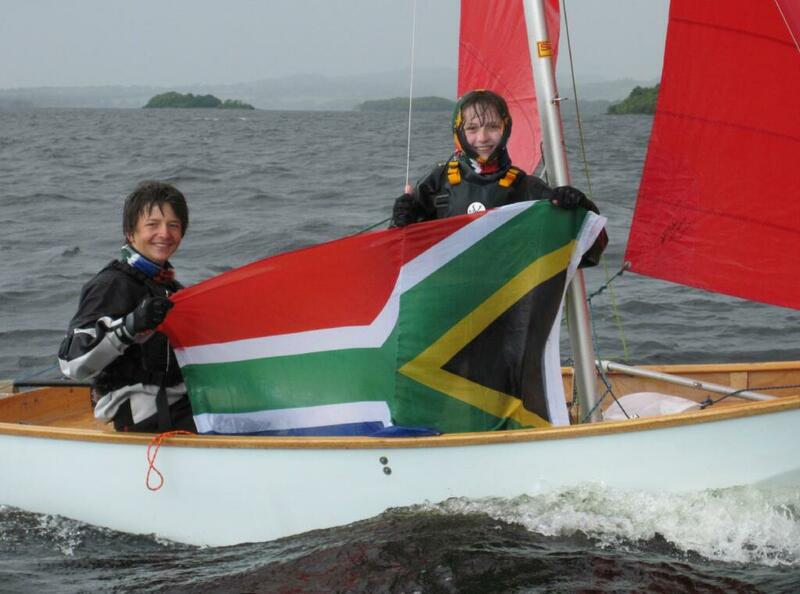 Congratulations to Ryan & Michaela Robinson from South Africa on winning the World Championships hosted by Lough Derg YC, Ireland. Second overall was Sarah & George Richards from GBR, there were 3 GBR boats in the top five. Full details and reports on Yachts & Yachting, full results here (the event website http://mirrorworlds2013.com was deleted early in 2014), lots of photos on the fotoboat.com website. The discounted entry prices for the 2013 Mirror Worlds & Irish Nationals at Lough Derg YC ends on Friday. Online entry and meal booking is available via the 2013 Mirror Worlds website.